Fear was not an appropriate reaction for a Starfleet Captain. No, that wasn’t right. Fear was absolutely an appropriate reaction. It kept a Captain sharp, focused on the task at hand when lives were at stake. But Captain Mallory Stanford had never, in her entire Starfleet career, felt like she wasn’t ready. She’d stood on the bridge of the U.S.S. Boxer and faced down Klingons, the Borg and more, leading her crew through crisis after crisis. Mallory had felt afraid plenty of times. She’d never felt unprepared. But the task facing her crew now was, quite literally, unbeatable. She sat down in her ready room chair. Her first officer, had handed her their new orders, and Mallory had marched in here in a blur the moment she read them. With a reaction like that, the bridge would be buzzing with speculation. The crew probably thought they were being sent to the front lines. The irony is, she would have been ready for that. Instead, she found herself faced with two words she never thought she’d see again. 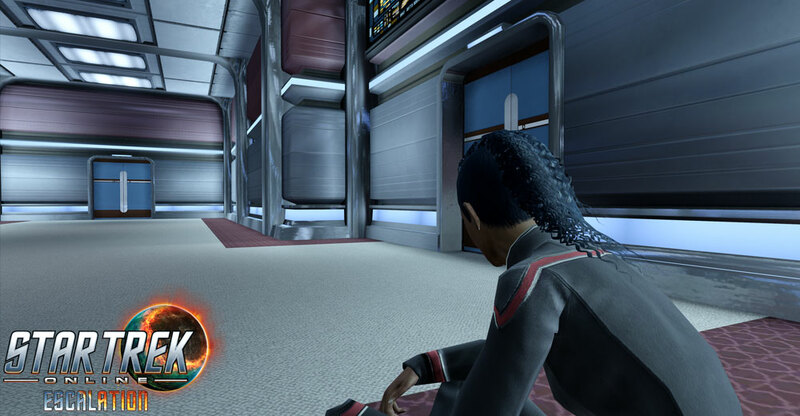 Cadet Stanford sank down in the hallway of Starfleet Academy. She had spent nearly forty minutes trying to find any part of this school that wasn’t full of people celebrating. It was the week before graduation, and there seemed to be parties everywhere. Nothing official, but they ranged from friends getting together for a quiet drink to the blaring music coming from the mess hall. This morning, she would have joined them. Now, she couldn’t stop shaking. It was a stupid test. You were supposed to fail. That was the entire point – their instructors had drilled that into them before they took it. The idea was to test your mettle as a Starfleet Captain, to see how you handle a no-win situation. It wouldn’t determine whether she graduated. Why was she shaking? No, it wasn’t the test, or that she’d failed. That wasn’t it. It was the content of the test. The simulations they ran at the Academy focused on diplomacy, exploration, and on combat, but none of them had ended like this. No matter what she did, more enemies appeared. Every order she gave seemed logical, but they all ended in disaster. The crew of the Kobayashi Maru had all died. Her crew had all died. She had died. It was too much. Maybe she wasn’t cut out for all of this. She took a deep breath, and brushed her curls out of her face. Before she knew what was happening, she was standing and walking again. Her instructors would understand. A last minute transfer from the Command Track to a different program was nothing new, even this close to graduation. All that mattered was that she never experienced anything like this again. She thought she heard a voice calling her name, but she kept walking. “Mallory!” the voice called again. She looked up. Striding down the hallway towards her was L’nel, from her astrophysics classes. They had barely ever spoken, but L’nel had been her helmsman in the test this morning. Her stomach grew cold and clenched up. This was about the test. “It will not take long.” L’nel said, closing the distance between them. Now that exams were mostly over, cadets were free to be out of uniform until graduation. She was dressed casually, for a Vulcan. Mallory hadn’t even bothered to go back to her room to change, and she realized she must look haggard. She stopped, and let the other cadet reach her, trying not to show the fear and indecision that made her veins into ice. What she wouldn’t give to have a Vulcan's emotional control right now. “I wanted to thank you,” L’nel said. “Thank me?” Mallory asked. That was – not what she had expected. “What? Everyone died.” Mallory said. Mallory couldn’t help a slight smile at that. L’nel seemed unamused. Ah, there it was, Mallory thought. She looked at the floor. This was the Vulcan version of pity. L’nel had sensed her emotions and come here to comfort her by lying to her. It was kind, but untrue. “Thank you,” she said quietly, “but I have to go. There’s a lot I have to think about.” She turned to walk away. Mallory tried to process this new information. L’nel had spoken to her before, mostly about class related issues. They had never had a conversation this personal. A warmth spread through Mallory, and she felt her stomach muscles finally relax. L’nel was right, of course. This was a part of her life she would have to deal with, and she alone would decide whether it would control her, or she would control it. Mallory was less than a minute into her breathing exercises when the door chime to her ready room buzzed. “Come in,” she said, putting down the PADD. She looked up, and smiled warmly as her ship’s counselor entered the room. The datapad slid smoothly across Mallory’s desk, and L’nel took a moment to study it before raising a single eyebrow. “We are retaking the test?” she asked. “The crew tends to take great pride in beating unbeatable challenges,” L’nel replied. “I would not be worried about them.” Mallory nodded in agreement.